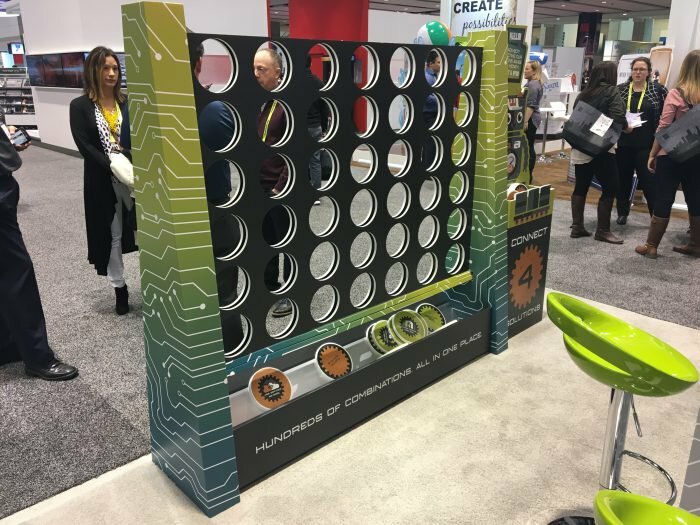 GlobalShop is an annual retail event that combines design, merchandising, shopper-facing technology and marketing, and brings together the retail world’s top influencers under one roof. This year’s event theme revolved around the volatile climate in the retail sector, with the hashtag #NotMyApocalypse being used on official show materials. Gilson chose to focus on the positive – that our customizable services can help counter the retail “apocalypse” and create game-changing solutions for retailers. Our experiences in this area paved the way for the perfect theme for our booth–robots! 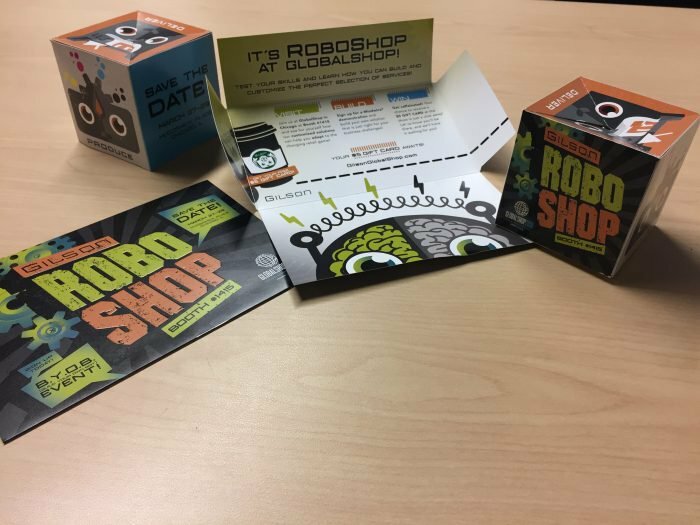 The “RoboShop” campaign theme took a fresh take on Gilson’s services and turned them into whimsical, interchangeable robots with a story to tell. 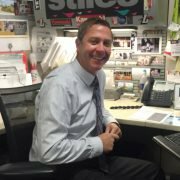 Gilson is a firm believer in a structured, targeted approach to pre-show marketing efforts in order to obtain maximum benefit from the trade shows we attend. This year was no exception. The campaign focused on each account representative’s warmest leads. Being mindful of our marketing budget, Gilson decided on an integrated approach using both email touchpoints and print for maximum exposure. 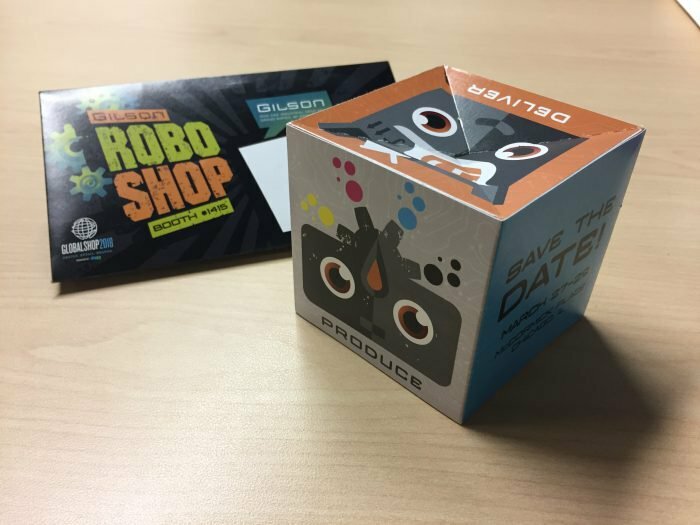 The first of two printed pieces was an embossed postcard in a crystal clear envelope and introduced the concept of RoboShop to the audience, with the second printed piece taking recipients by surprise with a rubberband-powered pop-up cube greeting. Both pieces encouraged visits to a personalized URL where users could sign up to visit the booth and have an exclusive look at Mindwire® 4, the latest version of our powerful B2B sales and marketing portal. Gilson’s account representatives were tasked with following up with each of their prospects either by phone, email, or LinkedIn (or all three) to encourage participation in the campaign. 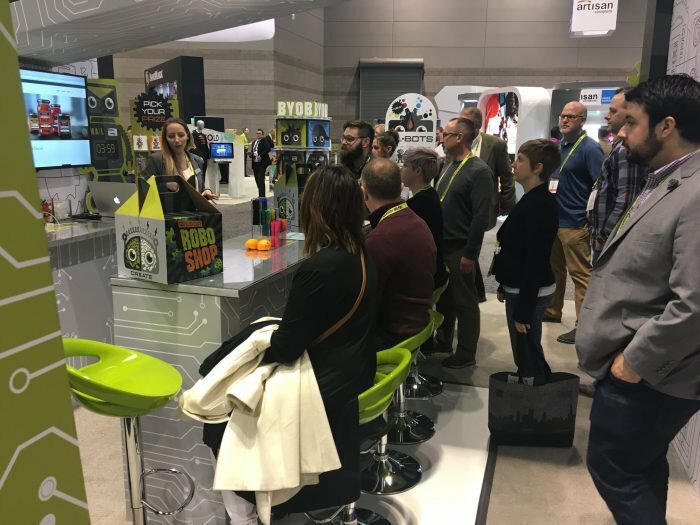 Knowing that GlobalShop is normally held in Las Vegas, but this year was taking place in Chicago, the sales team had a vested interest in making sure they made their touchpoints in advance of the show to help encourage booth traffic. 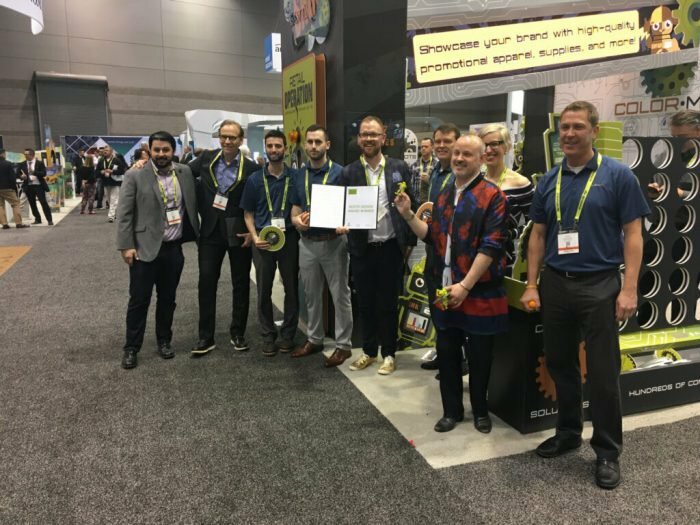 The change in venue meant that many regular GlobalShop attendees might skip the event altogether this year, and Gilson wanted to ensure that our efforts at the show were seen by as many qualified attendees as possible. Creating and designing the booth around the theme came next. Each year, Gilson strives to create a traffic-halting display in one form or another. This year was no exception, as we created larger-than-life games and activities to engage with our audience. For the second year in a row, we co-exhibited with Parker3D, a firm specializing in video display integration. The result was an engaging, interactive booth with video screens, touch-screen kiosks, and beat-boxing robots for the entertainment of all those who passed by. The graphics were locked, the booth concept was set, all we needed were fun activities that showcased our services. 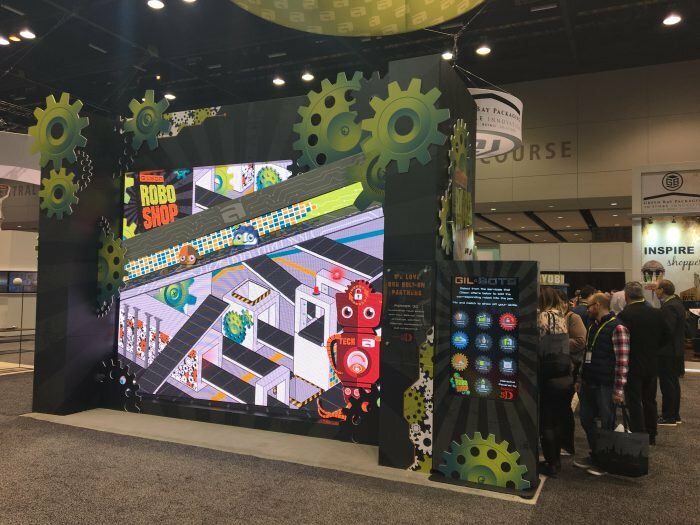 We created larger-than-life games that illustrated the RoboShop theme and how Gilson can help in the world of retail. Here are some of the fun activities we had at the RoboShop booth. 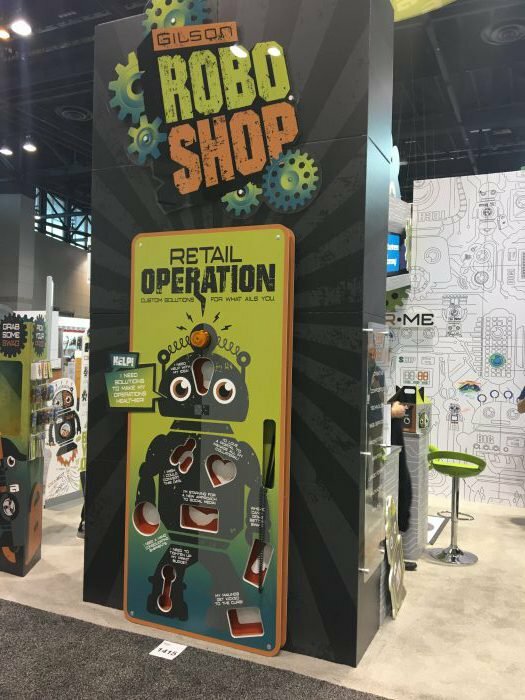 A giant electronic board featuring a Gil-Bot with retail pain points that attendees could use to see how Gilson’s RoboShop could help their business. A different take on a classic game that highlighted how any personalized set of services could help you adapt and win. A fun, rotating P.O.P.-style display that mixes and matches Gil-Bots to create your ideal solution. 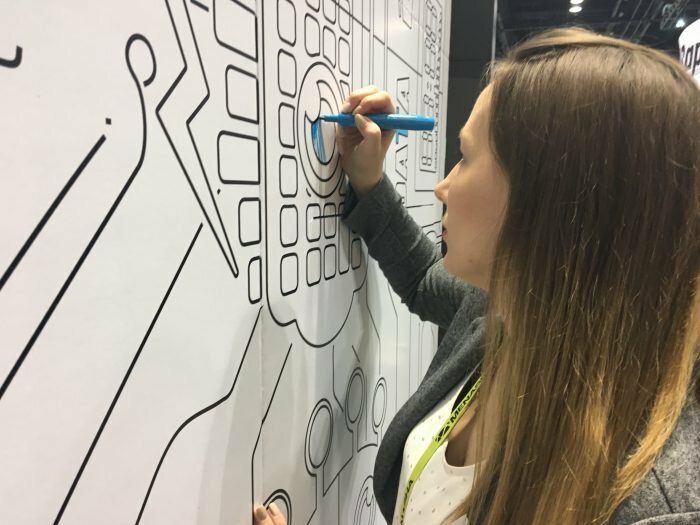 Part of the trade show booth featured a coloring wall where attendees could color in their favorite Gil-Bot or even draw their own fun designs. We also featured live demonstrations of Mindwire, one of the most powerful sales support and marketing portals to expand your brand, built with the retail sector in mind! Attendees were treated to a sneak preview of the newest features of version 4.0, and how it can solve some of the biggest retail print-on-demand, replenishment, and fulfillment challenges. 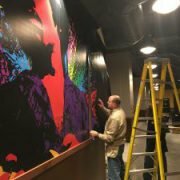 Combining the buzz created by our pre-show campaign materials with the excitement generated by our large-scale activities and use of floor space paid off. Our RoboShop booth won a Best Booth Design Award on the first day of the show. Alongside three other winners, we were chosen because of our interesting visuals, activities, and fun giveaways. (Plus they enjoyed the little dancing robots we handed out at the booth!) You can watch the booth award announcements here. (Jump to the 16:00 mark to see/hear our acceptance). 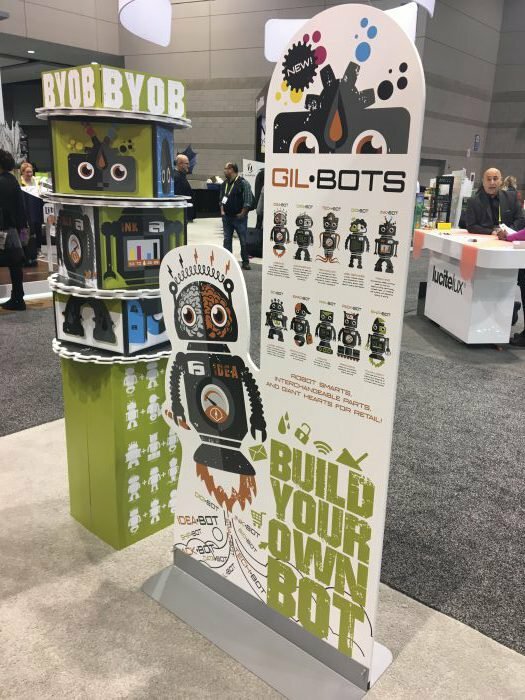 If our Gil-Bots haven’t already inspired you, we’d love to explore reinventing your trade show game. 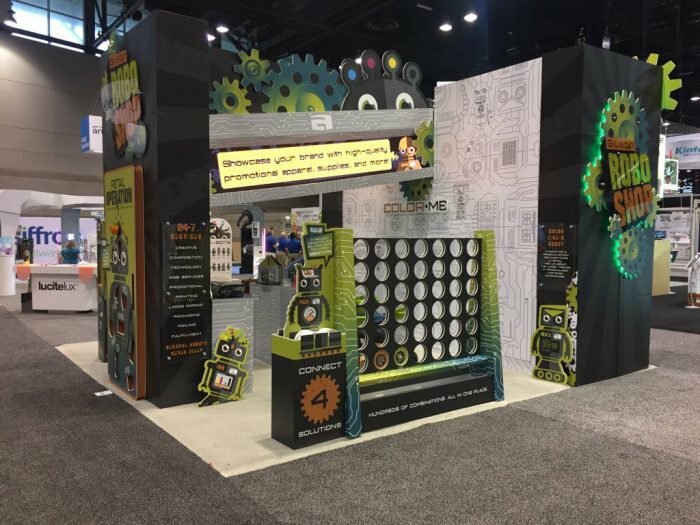 Creating a solid pre-show campaign strategy, along with a great theme, and strong execution are the building blocks of a great booth and show turnout. If you’d like to know more about creating an engaging trade show experience, contact your Gilson sales rep or visit us here to find out more.